Title : The Saga Of "Hawkwind"
Well, what can I say, Hawkwind's my band, so I really enjoyed this one. I suspect people who don't start to grin and nod when they hear "Brainstorm" would find parts of it a bit tedious, but it is a very comprehensive and entertaining illustrated history of the first thirty-five years or so of the star voyages of Captain Brock and the rest of the Hawklords. Rock on. 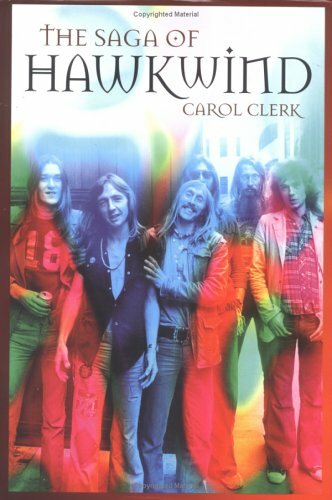 Exceptional Biography of Hawkwind!This is an unbiased look at the band right from the start. The author has certainly done an exhaustive amount of homework. A sheer pleasure to read and learn more about this fascinating band and the people in it. 9/10. The better of the 2 Hawkwind biographies. Some good stories in here.